Vit D Assay Controls comprised of human serum with the Vit D concentration on the label. Contains preservative. Store at 2-8℃. Vit D Enzyme Reagent comprised of 25-OH Vitamin D3 analog-HRP conjugate in a protein stabilizing matrix. 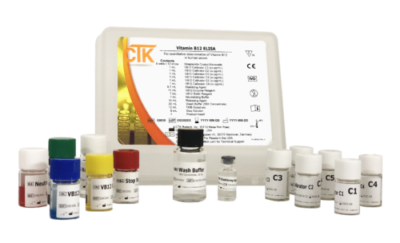 This test is intended for the quantitative determination of Vitamin D level in human serum. 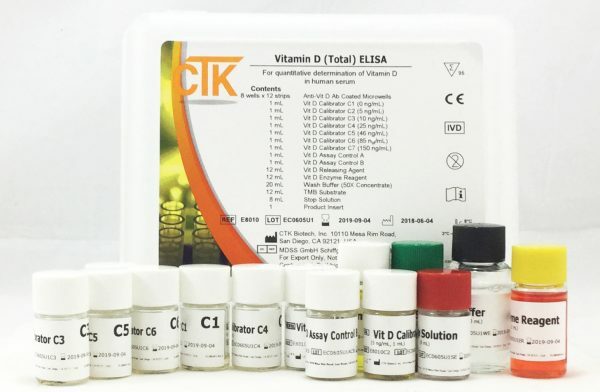 Accurate measurement of Vitamin D levels in patients is very important for the diagnosis of Vitamin D deficiency and for the monitoring of deficient patients in order to achieve optimal levels. Any interpretation or use of this test result must also rely on other clinical findings as well as on the professional judgment of health care providers. Recommended test for suspected Vitamin D deficiency related rickets, osteomalacia, and osteoporosis, as well as fetal development, immune system function, neurological disorder such as multiple sclerosis, cancer and many other pathologies. Initial laboratory tests for suspected Vitamin D deficiency. The 25(OH)D is the major circulating form and stays constant in the body for longer, so it is the most accurate and therefore most common biomarker of Vitamin D status. The sum of 25(OH)D in serum or plasma is referred to as total 25(OH) Vitamin D.